This is my introduction to this band from Twickenham, England. Quick verdict: not what I expected from a so-called “indie folk” band, with a much more expansive sound than that tag would suggest. This is a good thing – I hate labels and the forced categorization of music – and I quite enjoyed this album, which pays homage in equal parts (IMHO) to Bruce Springsteen, Tom Petty and 1980s English synth bands. Lead singer Charlie Fink doesn’t have a strong voice, but his low-key, careworn delivery is perfect for these songs, with lyrics about small-town characters living difficult or boring lives. These lyrics approach cliché – we’ve been done this road many times before – but combined with interesting instrumentation, nice hooks and occasional help from gospel-tinged background vocals, and the whole thing works. The Springsteen influence is particularly evident on “Tonight’s the Kind of Night,” one of the stronger tracks on the album. There’s the E Street Band piano sound plus lyrics about a boy pressed up against the window on a bus leaving his town. You can imagine Tom Petty writing the lyric “Lisa likes brandy and the way it hits her lips; She’s a rock ‘n’ roll survivor with pendulum hips” that starts L.I.F.E.G.O.E.S.O.N. (which I just discovered is annoying to type), another infectious tune. I really like the first track, “Life Is Life,” which builds up beautifully from a simple keyboard and percussion figure into a moving and melodic piano-driven song with 1980s synth handclaps. The choral breakdown in the middle the song is a bit strained, if only because the lyrics are so clichéd (“Your life is your life gotta live like it’s your life.”). Speaking of words, while I love the music, particularly the chorus, in “Just Me Before We Met,” the lyrics make me cringe: “Don’t be shy, be brave little champion.” Yuck (especially when you find yourself singing along)! “The Line” features some of the strongest lyrics on the album, particularly because Fink’s voice suits the material so well: “Is this the line between heaven and hell? Is this the line where I get up and walk out? Is this the line where you get drunk you yell?” They must have been tempted to go all out on this song with such powerful lyrics, but instead they took a quieter approach that actually increases the impact of the words. 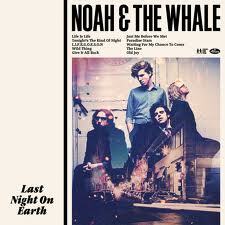 If you like any of the artists I cited earlier, or in a more recent context, a band like Frightened Rabbit, then you’ll quite enjoy this offering from Noah and the Whale.